UVA and/or UVB rays? SPF 15, 20 or 50? How often should one apply a sun protector? How much sunscreen should I use? The topic of sunscreen raises many questions, and importantly so. We have compiled and answered the most frequently asked questions below. Why should I protect myself from the sun? Sun protection is necessary due to the fact that the sun emits two types of ultraviolet rays that can damage your skin. The first type, called UVA rays, are ultraviolet rays that have a wavelength of around 315-400 nm. These waves are strong enough to penetrate most fabrics (except for leather, which offers strong protection). Since UVA rays are so strong, they also have a strong impact on the aging process of our skin. For this reason, a sunscreen with good UVA protection is one of the best anti-aging products you can buy! The second type of harmful ultraviolet rays is called UVB rays. Ultraviolet B waves have a wavelength of 280-315 nm and can only reach the epidermis, the outer layer of our skin. Since the UVB rays can reach and burn this outer skin layer, they are often responsible for sunburns and redness. Do Sun Care products protect against UVA and UVB rays? Sunscreens should protect against both UVA and UVB rays using a broad-spectrum filter. In Europe, the UVA protection of a sunscreen must protect against at least a third of the UVB rays. The certification for this value can be seen on packaging with the UVA symbol- a circle with the word “UVA”. What kind of filters protect against harmful rays? In the production of sun care products, two different types of filters are commonly used to filter out harmful rays. The first kind of filters is chemical filters like Ethylhexyl Methoxycinnamate that absorbs the UV rays and changes them into thermal (heat) energy. These kinds of filters are not approved for use in natural skin care products because they are criticized for causing allergic reactions and are linked to harming coral. The second kind of filters that protect against UV rays are called mineral filters and are used in natural sun care products. Mineral filters reflect sunlight instead of absorbing it. Instead of absorbing the sun’s rays the way conventional sunscreens do, mineral filters sit on top of your outer skin layer (the epidermis), providing a shield against harmful rays. For this reason, they are also referred to as “physical sun protection filters”. The disadvantage of using a mineral filter like titanium dioxide or zinc oxide is that they, depending on the size of the particles used, leave a white film on your skin during use. For this reason, some companies slightly tint their sunscreens to reduce the whitening effects of the lotions. Since 2013, the size of the nanoparticles (smaller than 100 nanometers) of the minerals must be declared on the product’s package. Whether or not nanoparticles can be absorbed by the skin is often disputed. Plant based oils also provide a (low) natural sun protection factor. Due to the antioxidants they contain, these oils are often found in natural cosmetic products. How long can I stay in the sun wearing sunscreen? The length of time that sunscreen is effective on your skin depends on the individual. For those with light skin, most people can stay in the sun for 10 minutes before burning without applying sunscreen. Those with a medium skin tone can stay in the sun up to 15 minutes, and those with a dark skin tone can stay in the sun up to 20 minutes before burning. This number can be multiplied by the sun protection factor number (SPF) listed on the package. For example, someone with a medium skin tone can stay in the sun for five hours using an SPF of 20. Sunscreens do not completely block out UV rays, they simply block the majority of them. An SPF of 15 offers protection from about 94% of UVB rays. SPF 30 blocks up to 97% of these rays and SPF 50 blocks up to 98%. Applying sunscreen multiple times does not increase its protection factor but is nevertheless important, especially after being in the water, sweating, towelling off, or changing clothes. To enjoy the full protection of your SPF, you will need to use a large amount of sunscreen. The amount of sunscreen necessary is estimated as 2 mg per cm2 of skin, which means that you’ll need more than 30ml for your whole body! Since most people do not apply that much sunscreen at one time, you’ll have to take into account that the SPF will be less with coverage. A rule of thumb for applying sunscreen to your face is that you should use at least a third of a teaspoon (about the length of a finger) to be well protected. Which SPF makes the most sense? The effectiveness of the SPF of your sunscreen depends on your skin type, your location, the time of day and the length of sun exposure time. For everyday use, an SPF of 15-20 should be enough. If you are travelling in the southern parts of the world or have light or fair skin, we recommend using SPF 30. If you are allergic to the sun, you should use a higher SPF. Tip: If your skin care products contain fruit acids or Vitamin A, your skin will be more sensitive than usual! Use a higher SPF to balance this sensitivity out. How can I additionally protect myself against the sun? Sunscreens are not the only way to protect yourself against the sun. Long-sleeved shirts, wearing clothing, wearing a large sun hat or sunglasses also helps. Avoid the sun during the hottest part of the day or between 11 - 3 pm. Keep to the shadows or avoid direct sunlight during these times. Eating foods that are high in antioxidants such as carrots or pumpkins is also smart (these two examples contain beta-carotene). What kind of natural sun care products are there? 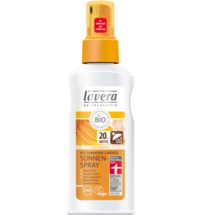 At the moment we have a large selection of sun care products to choose from, from sunscreens to sun milk to sunscreen sprays, liquids, gels or oils. We have all kinds of products to care for your skin! Summer, Sunshine & Sunburns Amla Powder: Beating Summer Sweat!